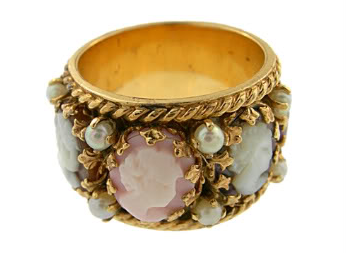 The cameo ring is classic and every gal must own at least one variation of this timeless jewelry statement. They seriously don't make things like this anymore. 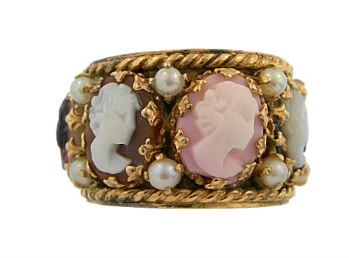 In my quest for cameo rings I found this early 1900's cameo ring. So since true cameo rings can range from the hundreds to many thousands and the requests for cameo rings were aplenty, I found Jan Michaels. She uses a mix of vintage materials so the quantities of each are limited-and all her pieces are constructed by hand in her San Francisco studio. She totally reminds me of a wacky Aunt who wears designer glasses, practices yoga, shops at the Tibetan import store, and drinks lots of red wine. Many styles to choose from, ranging from $28-$48. See them online, or at either shop location.